So on to the main event itself. 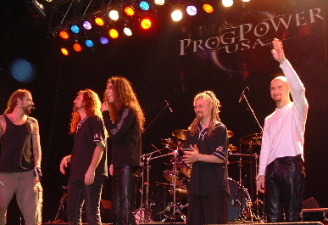 The USA version of Progpower is now in its second year having begun with two events in 2001, the second of which took place at this very venue, the Earthlink Live, in November 2001. This time around, the event was a complete sell-out due in part to the positive feedback from the previous year's event, an internet campaign which built up demand such that the entire 1200 tickets were sold out within days of going on general sale (more than 3 months ahead of the event itself), and a bill featuring a number of acts making their debut performances in the USA. The Earthlink Live, Atlanta, GA. The event got underway promptly at 5PM with the American act Zero Hour, whose brand of technical progressive metal is not really my cup of tea. With the attractions of many well stocked (and attractively priced) CD vendors in the lobby of the hall, many attendees, like myself, found the temptation too strong and missed their performance entirely. After a break of 30 minutes, the standing area in front of the stage filled up rapidly along with the majority of the 800 or so seats in the amphitheatre, as German/American outfit Silent Force came on stage. Having seen the band previously I was not anticipating anything extraordinary, but for the band's Philadelphia-based vocalist D.C.Cooper it was a special occasion, since he rarely gets the opportunity to perform in his homeland and he was certainly fired up for the occasion. Concentrating mainly on material from the band's second album Infatuator, the band, and D.C. in particular, really got the crowd moving. The audience was a little quieter during Whisper from D.C.'s solo album and the Royal Hunt tune River of Pain, perhaps because the music was less well known, but they went crazy, clapping, headbanging and singing along as the band closed the set with Use The Power, Infatuator and the old Judas Priest classic You Got Another Thing Coming. The good mood continued during the following set from German 5-price Edguy. The outfit from Fulda's act owes a lot to the big names of the 80's Metal scene such as Helloween and Iron Maiden and they certainly know how to have as much fun onstage as their audience, employing the full range of cheesy arena-rock cliches. Opening with a couple of tracks from their most recent disk Mandrake, it was clear that many of the audience were familiar with the band's material and they sang along joyfully to tunes like Babylon and Land of a Miracle rather to the band's surprise. Front man Tobias Sammet has a good sense of humour and was soon joking with the audience about how he'd been told that "Metal was dead in the USA", but as the remainder of the set proved, this was certainly not the case. Concentrating mainly on material from the band's last three studio albums, they stormed through their 50 minute set and as Tobias got the crowd to their feet and then encouraged them to sing along during Painting on the Wall, one could be forgiven for getting the impression that they were the real headliners, such was the force of Tobias's personality and the enthusiastic reaction of the crowd. As their set finished, organiser Glenn Harveston was introduced on stage and recieved a well-earned ovation from the crowd. He then introduced 3 of the members of Evergrey who has come over from Sweden to enjoy the festival and they too got a warm reception from the crowd, many of whom had seen the band play at the previous years event. The band's freshly recorded new album Recreation Day was then played over the venue's PA system, though the inevitable sound checking of equipment for the following act made it rather difficult to fully appreciate it. Edguy were indeed a very hard act to follow and by contrast, German "Tolkein Metallers" Blind Guardian were a disappointment. Originally lined up to play the headlining slot at the end of the evening, the band had asked to change slots as their tour schedule meant that they had to catch an early flight to Quebec the following morning. Perhaps they also suffered from not being sufficiently different in style to that of the two preceding acts. 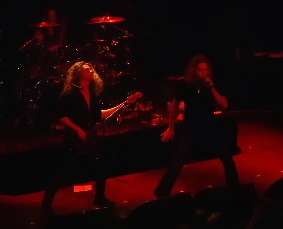 Introduced on stage by Jon Schaeffer of Floridian Power Metal kings Iced Earth (a big fan and friend of the band), they began with War of Wrath and Into the Storm. The sound had been excellent for the previous acts, but there now appeared to be a distinct lack of bass and the band's overall sound was a shadow of the powerful epic roar which I had anticipated hearing. Unlike myself, the vast majority of the audience were clearly disciples of the band and it was clear that this was the most popular band of the evening and the act that many had made the trek to Atlanta to see. The band played a range of numbers from their extensive catalogue, mixing loud, powerful rockers with more intimate, acoustic numbers like Bright Eyes. Although I found their songs to be rather linear and their stage act rather uninspired, the response from the audience was rapturous and the band were eventually forced to drop their final encore from their set as the schedule threatened to over-run. They came, they saw and they conquered. They can be content with their performance, however uninteresting I found it myself. Once the big draw had completed their set, the venue emptied alarmingly. Sure it was close to midnight, but with the Swedish Progressive Metal stars Pain of Salvation closing out the day, I had anticipated a greater proportion of the crowd sticking around to witness their set. For the enthusiasts who remained, it meant that it was much easier to obtain a good view of the stage, though with the venue�s air conditioning set for a full house, the temperature within the hall dropped noticeably for the hundreds who remained. This time they began with the introductory instrumental Spirit of the Land, followed by Inside, a number which they have used to conclude a number of their live performances this year. The response from the crowd was warm and welcoming as Daniel Gildenlow introduced "A new song", namely Of Two Beginnings from the Remedy Lane album. Following several more tracks from the same disk, Daniel, looking a little exhausted, explained how he had flown in from Europe where he was on tour with the Flower Kings and moaned that British Airways seats weren�t really designed for people as tall as him. Turning to tune his guitar, he questioned the crowd "Tuning up to flat E, means?". As quick as a flash, a fan in the crowd replied "Entropia" (the band�s first album), �and the song?�, Daniel continued. "People passing By" shot back the answer. Clearly there were some dedicated fans present! Then, following a further Remedy Lane number Undertow, the bulk of the remainder of the set was composed almost entirely of songs from the The Perfect Element: Part 1 album, with Song for the Innocent, Falling and The Perfect Element all performed with the usual emotion and musicianship. Before the following song Daniel then took the time to announce the launch of the North American Pain of Salvation fanclub �Used� and commended the organisers on the production of some fine fanclub T-shirts, modelled on stage by his brother Kristoffer (on bass) and 2nd guitarist Johan Hallgren, who fooled around, acting like a catwalk model to the crowd�s amusement. After which they proceeded to play the tune of the same name and the final Perfect Element extract, In The Flesh. Testing the musician fans in the crowd once more, Daniel declared that he would be tuning down to flat D, indicating that they were about to play ! (Foreward) and what an emotional set closer it was. Though it was by now after 1AM in the morning, the crowd had still clearly not had their fill and they demanded the return of their heroes for an excellent Ashes to which they sang along heartily. Sadly there was not time for any more and the remaining fans made their ways back to the hotels in the neighbourhood. Having seen Pain of Salvation four times this year, I have to rate this as the best and most complete performance I�ve ever seen from them. Despite Daniel�s complaints of tiredness, the band performed excellently and clearly enjoyed playing to an American audience for only the 2nd or 3rd time. As so the day came to an end. Each band had given its all and the large enthusiastic crowd had roared its appreciation of the musicians and of the team of individuals who had made the event happen. However we were but half way there and another music-packed evening awaited us the following day.